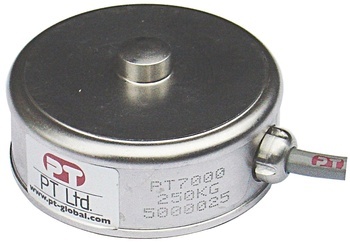 The PT7000 stainless steel mini-disk load cell is ideal for tank, hopper and silo weigh systems. Offering a high protection rating of IP68, it’s ideal for food hygiene and high wash down areas. The advanced welding technique used makes it the best low profile sealed stainless steel compression load cell we have ever offered. PT7000 can replace LPX models to offer a higher IP protection rating. An upgrade plate is required if a PT7000 is used in an existing LPX mount. PT7000 doesn’t bolt through the bottom plate, it’s a simple drop in load cell which is easy to remove for maintenance and repairs.